Anyway I unearthed another 3 special Pink Ribbon promotional offers by Bobbi Brown, Estee Lauder and Clinique. Estee Lauder has been doing Pink Ribbon campaigns for a few years now as I recall and I’m sure most of the companies under their umbrella will have specials too. Here’s what I found. Pink Quartz Glitter Lip Gloss and Tulle Lip Color lipstick set. Pair it with Tulle Lip Liner which comes with a sharpener. 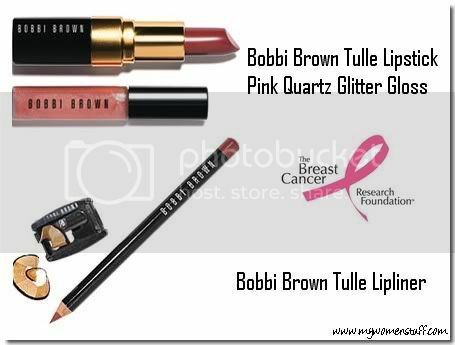 Pink lip items from Bobbi Brown’s stable from which a portion of proceeds will be donated towards the Breast Cancer Research Foundation. And the one item Estee Lauder has every year, the Jeweled Pink Ribbon pin set with twinkling crystals and is a collectible. Clinique’s offering of a Butter Shine lipstick in Ribbon Pink (limited edition) comes with a silvery case. Costing US$16.50 a whopping US$10 is being donated to breast cancer research! There are a few other brands doing the Pink Ribbon campaign but they aren’t available here at this time – Smashbox, DuWop and Too Faced are a couple more. I’m not sure if the Pink Ribbon collections by Bobbi Brown, Estee Lauder and Clinique will be available here but if they are, it would be great! It would be quite meaningless if we get them only after October right? Great post! I am so lemming that Clinique lipstick-pink is so my colour!